Every year, Ellen Hutson gathers together some crafters to create tags – with a feminine twist! It’s my turn today, along with the talented Laurel Beard…go see her tag over on the Ellen Hutson blog, because she’s got some Art Impressions going, too! Watch the video below or click HERE to see it in HD on YouTube. The vellum tag can be torn from this tag so the watercolored tag can be saved and used for an ornament – or regifted on another package by writing on the back! The coziness of the cottage on this tag has me thinking about how *not* cozy our fellow Americans in Puerto Rico are this Christmas. They still have sporadic power and potable water. So many homes are still a shell with a tarp tied on top. They’d love to be at a cottage like this one….and though I can’t build them a house, I can do my part and donate. One of my wonderful readers named María is from Puerto Rico – she is currently in Florida – gave me an update on my previous fundraiser. She let me know that some of the charities have been more effective than others, and she has family on the ground giving her the true scoop. Probably kinda like the government agencies that have been on the sporadic side too. But I was gratified when she told me that The Hispanic Federation/Unidos is doing excellent work, because I’ve been making monthly donations there, at the recommendation of Lin Manuel Miranda (of Hamilton fame) whose recommendation I trusted. It was great to hear the same from a reader who agreed! So….go give. Be generous. Let’s help Puerto Rico have a little bit merrier of a Christmas. aAbsolytely AWESOME! Your painting always amazed me! Great work, love how you always give tips and tricks on the way. Thanks! Great tag ! I love the vellum idea. Love your technique!!! Great tag!!! Wow! What a beautiful tag. Great tag. Interesting how the color changes. Awesome tag, Sandy, & the vellum overskirt is a fabulous idea! Sandy this tag is fantastic. I love the vellum so that you don’t mess up the wonderful art with the to/from. Terrific idea. 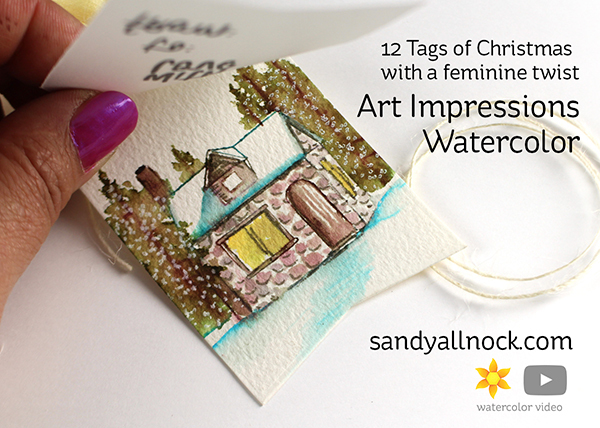 Fabulous tag and love your watercoloring! I like the idea of the vellum so it can be removed later~so clever of you!! Your ideas sure make for a Spectacular post! Beautiful tag ! I really love the idea of the vellum tag on top, it’s excellent ! So pretty. Love that you stamped the text onto a different layer. I love the AI stamps,they make projects look so amazing.This is such a nice little tag.Thanks Sandy. This is so pretty and I like that this tag can be re-purposed by simply removing the vellum. Thank you for the video too!